Sometimes it's fun to just blow up your palate. There are a lot of ways to do this, and the payoff is the pleasure that results from spicy hot or super-sour bites. The pleasurable burn of fresh ginger mellowed by a sugar crust holds that sort of reward: think of it as a high dive for your taste buds. This is a full-flavored candy on its own, but it also gives a hearty oom-pah-pah to cookies, candies, quick breads, and so on. And while I would never pass myself off as someone qualified to offer medical advice, in my own personal experience, this is an entirely tasty panacea for nausea, morning sickness, and motion sickness. I prefer it sliced thin and on the crunchy side, but if you prefer it cubed and more chewy, chop accordingly. Peel the ginger and, using a mandoline or sharp knife, slice it very thinly, about ⅛ inch thick. Bring 2 cups of the sugar and the water to a boil in a medium saucepan. Add the ginger, stirring to coat; lower the heat and simmer, uncovered, for 30 minutes. Turn off the heat, cover, and let steep for at least 2 hours or overnight. Pour the remaining 1½ cups of sugar in with the drained ginger pieces and mix with your hands, coating every surface of the ginger with sugar; make sure the ginger pieces don't stick together. Spread the ginger out in a single layer on a baking sheet and let it dry overnight, stirring once or twice. Once it's completely dry, move it to an airtight container lined with a paper towel. The ginger will keep for up to a year in the refrigerator. 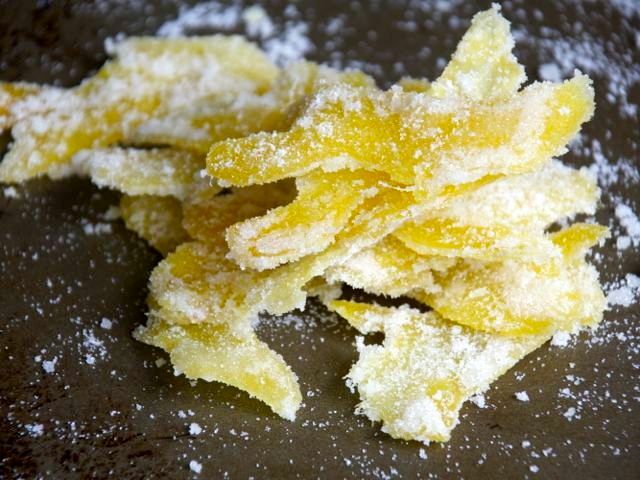 Save the sugar that falls off from the crystallized ginger for other uses: to sprinkle on top of Ginger-Lemon Scones, to add an extra jolt to sugar or ginger cookies, or to make a sugar rim for a cocktail. To make a sugar rim for a cocktail, run a cut wedge of lemon or lime along the rim of a martini glass, then dip and swirl the glass rim in a saucer of ginger sugar.